Managing risk one employee at a time. Finding and keeping the best person for the job is more than just an interview and a gut feeling. One bad hiring decision could end up costing your company thousands of dollars in turnover costs or negligent hiring claims. VeriFirst can help you hire and retain the right employees with affordable, risk mitigating, front-end solutions customized for your unique business. 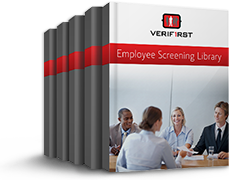 VeriFirst offers multiple levels of searches, depending on your company’s industry, budget, and tolerance for risk. Our comprehensive pre-employment and post-hire background checks are guaranteed to help you decrease corporate liabilities, reduce fraud, promote a drug-free environment and prevent violence and theft. Instantly view detailed and summarized credit information including open accounts, public filings, payment histories, and current financial status. With more than 5,000 testing centers available nationwide, we make it easy to get drug tests, pre and post-hire. The five-panel drug screen tests for traces of opiates, cocaine, amphetamine, marijuana (THC), and methamphetamine. Results are reviewed by a board of medical review officers (MRO) and posted electronically to the VeriFirst website. Federal criminal record searches can show criminal court file information, accessed via one or more of the 94 U.S. federal district courthouses located throughout the nation. Federal criminal record searches are conducted at the specific U.S. district court covering the region where an applicant has resided. Receive a comprehensive search of statewide criminal records. Results may include felonies, misdemeanors and traffic violations. Due to legal restrictions, some states do not allow repositories to disseminate criminal record data. States that do permit dissemination may require fingerprint cards or a special state authorization form, which may have to be notarized. VeriFirst will notify you of state requirements upon submission. Verify an applicant's current and / or prior employer information, including: title held, dates of employment, salary, reason for leaving, and other information as provided by the applicant and / or employer. 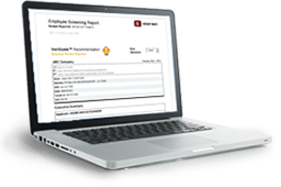 A configurable GAP report is included, identifying potential breaks in an applicant's employment history. Verify a person’s educational history, including institution, dates attended, diplomas and degrees received, and additional information as available. Verify professional license numbers and certifications as required by industry. Records may include: issuing date, registration status, current standing, applicable sanctions, expiration date, and other information as available. License types include: CPA, medical license, teaching credentials, and more. 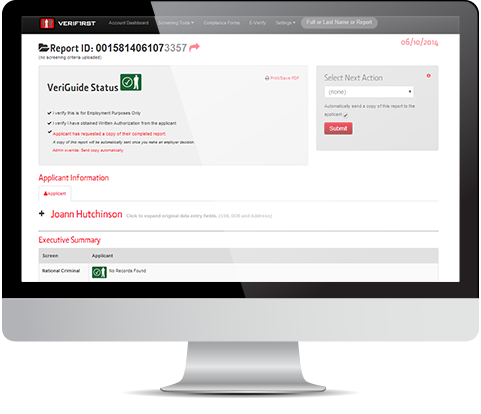 Verify an applicant's driver's license number and status. Get a detailed driving history of violations, accidents, suspensions and other information as available.